What does Bizagi Studio use? Processes and their automation details in Bizagi are stored in a database. Bizagi Studio presents an integrated runtime environment where you can login to test your automation process. As the building process takes place, this runtime environment, or Work portal, reflects in real time all the changes performed in Bizagi Studio. The Work portal is a web-based application that only requires a browser, and it is hosted using a web server instance. Where you host this web server instance and Work portal, is called the Application Server. 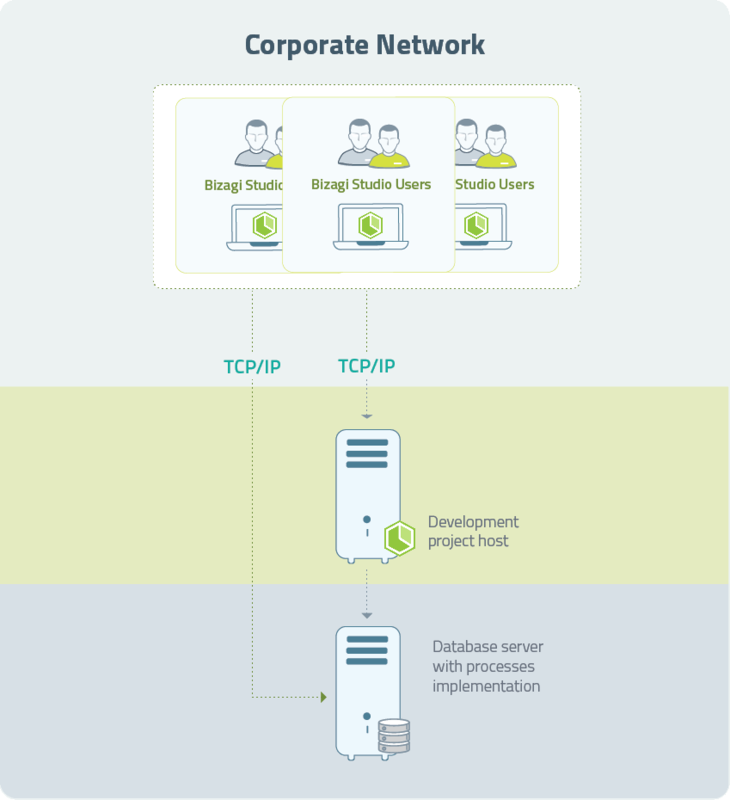 Bizagi Studio uses this web server so that you may anytime launch the Work portal, just as it would be seen and made available to the end users on a working environment. Bizagi Studio automatically generates the Work portal and provides this runtime environment for your automated processes, in order to allow you to carry out quick prototyping and tests. You may choose a quick start setup for which you can have everything needed by Bizagi Studio installed locally, or you may also choose a teamwork collaboration setup for multiple users to work together in your corporate processes automation. Note that at any moment, you may easily move your project from that quick start setup into a teamwork collaboration setup. If you are going to install Bizagi with the default database, SQL Server Express 2017, keep in mind that you cannot install SQL Server Express 2017 when C++ Redistributable 2017 is installed. Uninstall it before installing SQL Server Express 2017. You can reinstall it after. You may choose to have Bizagi Studio install for you a local database instance, and use a local web server instance as well. This option is useful to achieve fast results for demos, product evaluation or prototypes. SQL Server Express 2017 is not supported in Windows 7 and Windows Server 2008. If you have any of these OS installed, you'd need to select Skip this step (I will install the database later), and install a compatible database. •IIS Express used for a .NET platform. The quick start setup allows you to easily get started using Bizagi, with the required components set up locally on your system. 10 GB of free space. These Widows versions must have their Service Packs up to date. Local SQL Server 2017 instance, Express edition, included in Bizagi Studio installation (recommended). You may choose to use a different supported database (see the database server requirements to view supported databases). Local IIS Express 8 included in Bizagi Studio installation. This runs the processes in a .NET platform. Bizagi Studio installs Microsoft's .NET Framework version 4.6.1 (which in turn includes other components such as Visual C++ 2010, 2008 Redistributable). Once you are certain you meet with this requirements, no additional configuration is needed at this point to get started, so you may skip the chapters on requisites. •Bizagi Studio installs Microsoft's .NET Framework version 4.6.1 (which in turn includes other components such as Visual C++ 2010, 2008 Redistributable). •Oracle Data Provider for .NET component (applies to projects using Oracle database). 1. Operating systems and settings in Turkish language are not supported. All involved machines will need to be set with regional settings different to those for Turkish language and culture (tr, tr-TR). The hardware requirements will also depend on other variables such as: the processing demands of tasks, the number of users working in the team, if there are multiple integration points in the processes, amongst others. Therefore, the requisites presented above are the minimum you should consider. •The host machine provides a high-speed disk as well. This is really important especially for the database server which constantly performs I/O operations. •Each virtual machine at the host is configured to have a reserved amount of resources accordingly (relevant to lock/limit memory, CPU, RAM, or other resources when operating alongside other virtual machines on the same host).